If asked, most people deny they even do it. But it’s a fact of life that most of us, at some point or another, will have to face pooping at work. Even now, if someone catches you reading this, you might giggle nervously and explain that you, personally, don’t even poop. Like, ever. Because admitting to pooping is strangely embarrassing, even though we all do it in some form or another. It’s actually a great leveler. If someone intimidates you or makes you nervous, imagine them pooping. There’s probably nothing more likely to make you aware of someone else’s humanity than the realisation that they also poop. You’re at work when you feel that familiar rumble. What are you going to do? The answer is obvious. When you have to go, you have to go. You might consider holding it in, at least for a while. But don’t let it go too long. I’ve read that doing so can actually kill you, among other things. That is not the epitaph you want on your tombstone, I’m sure. The other great danger is, of course, exploding in a shower of poop at your desk. Don’t risk it! Much better to get it out of the way. 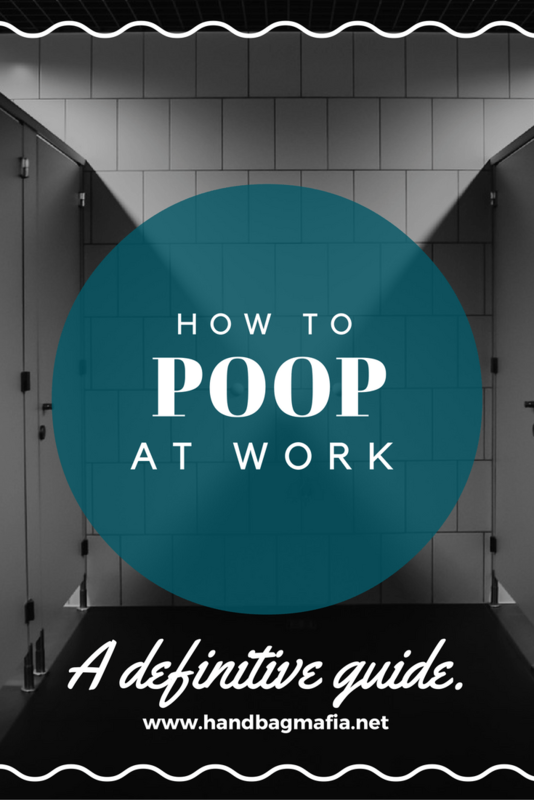 Here’s a simple and definitive guide on how to poop at work and get away with it! Step 1- Know Your Bathroom. Make like a Boy Scout and be prepared. You might think it’s as simple as knowing where the nearest bathroom is but this is probably your first mistake. If you truly want to hide the fact that you poop from your colleagues and co-workers, you need to do a bit of building recon. It might not be possible if you work in a smaller business but for others, suss out the bathrooms on other floors. Obviously, this needs to be done in advance rather than when a work poop is imminent. You have to be organised as well as prepared. Once you’ve decided on a bathroom, there are two other main issues to consider. The second is to know your water pressure. Why? Well, this all comes down to technique. If you have good water pressure and a loo that refills quickly, you might want to flush before you wipe as part of your odour control strategy. I don’t recommend that you remain seated for this step. Step 2- Check Your Resources. For Pete’s sake, ensure there is adequate toilet paper. Don’t risk it. If there is any doubt, change stalls without delay. Also, if you use the last of it- replace it! Good manners apply at work, too, you know. Don’t be that guy! Step 3- The Landing Pad. Preparation is key in the workplace poop. This is where the Landing Pad comes in. This involves making a small wad of toilet paper and popping it into the bowl before hand. It serves a dual purpose; it muffles the sound of any splashing that may alert fellow bathroom users to what is going on in your stall while also minimising the need for toilet brushing. If, as mentioned in Step 1, you don’t have access to a brush, ensure you make a good sized Landing Pad to line the bowl, hopefully eliminating any chance of residue. Depending on your water pressure, you may opt for the flush before wiping. If this isn’t an option, once you’re done you have to be quick with your clean-up. Now is not the time to scroll through Facebook on your phone and I hope you haven’t been silly enough to bring a magazine. If you have, drop all pretenses. They know what you’re doing in there. Your best bet is getting rid of the evidence as quickly as possible. Don’t bother carrying an “air freshener” spray. It’s a dead giveaway and they don’t really work, anyway. They just give a strange floral/vanilla/citrus overlay to the existing poop smell. You aren’t fooling anyone. You could try to keep the bathroom stocked with an odour-neutralising spray. If anyone sees you, you can always blame other people and say you’re sick of these work-poopers leaving the bathrooms in a state- the perfect crime. Otherwise, consider carrying a box of matches. Strike a match to help to clear any smells- it might actually work better than sprays; it must be true- I read about it on the internet! Pooping at work isn’t always going to be seamless, no matter how careful you are. Sometimes, another person will walk in. Such is the nature of communal bathrooms. What you do depends on where you are in the process. If you haven’t started, you can try to wait it out until they leave (but not too long, because, you know, possible death!). Otherwise, have a listen for the tell-tale rustle of a Landing Pad in construction. I couldn’t find a solid etiquette guide on this but my figuring is that if they are also attempting to poop at work, you’re good to go. I would suggest leaving before them if possible or waiting until they’ve gone. We know there’s no shame in the work poop but there’s also no need for awkward eye contact over the hand basin if you can avoid it, right? ← Learn from My Fashion Mistakes.